Make this home your own, priced to sell! 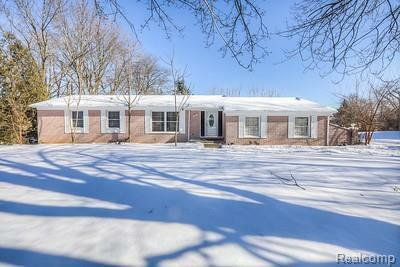 Spacious brick ranch in West Bloomfield, with 1/2 acre lot. Open concept floor plan in main living space. Builders own home, very well built with high standards. Fiberglass insulation, great windows, full brick, make this home very energy efficient. The home was built with a foundation to allow a second story by replacing the trusses with a Cape Cod design making this home capable of being nearly 4,000 square feet. Half acre lot, with fruit trees, cherry and apple, and a organic garden area (soil cultivated for years). Large 2.5 car garage with plenty of room for lawn equipment, and shelves for storage. Laundry room / mud room can be reconfigured to accommodate a second full bath on the main level.